Hoops can be made to suit persons of all sizes and ability levels. Whether you are tall or petite, thin or voluptuous, athletic or just-starting-out, I can adjust the size, weight, and thickness of your hoop to give you a perfect fit! I also make my hoops in a wide range of colors. 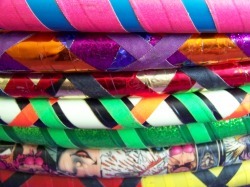 Specialty hoops, such as collaged or personalized with names or photos, are available upon request for an additional cost. Also, extra-large hoops (diameters over 45 inches), please add $5. Contact Cosmic Swirl with any questions you may have!